Would you ever purchase a used mattress? In an informal poll, we found that less than 10% of people would buy a used mattress. Surprisingly however, a ton of people try to sell used mattresses all of the time. 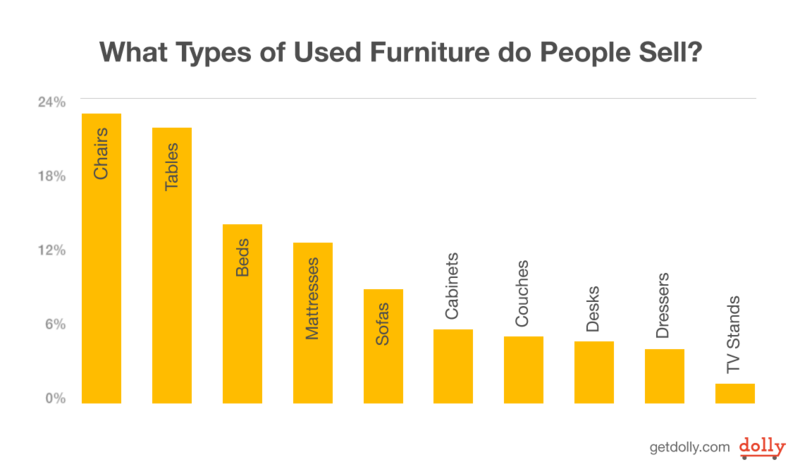 We found mattresses were the fourth most listed furniture type behind chairs, tables, and beds. Due to how people tend to categorize their furniture, it’s unclear how to make the distinction between bed frames and mattresses, but the data clearly shows that they’re a popular second-hand item listed to be sold. It seems likely that people were much more inclined to purchase a used table than a mattress. In fact, in the same informal poll, 100% of participants said they would buy a used table versus the less than 10% who said they would purchase a used mattress – clearly, they’re viewed very differently when buying used furniture. When asked about the reasons behind not buying a used mattress, it came down to concerns over cleanliness (derived from how mattresses and tables are used differently) for the two furniture items. How often are new vs. old mattresses sold online? 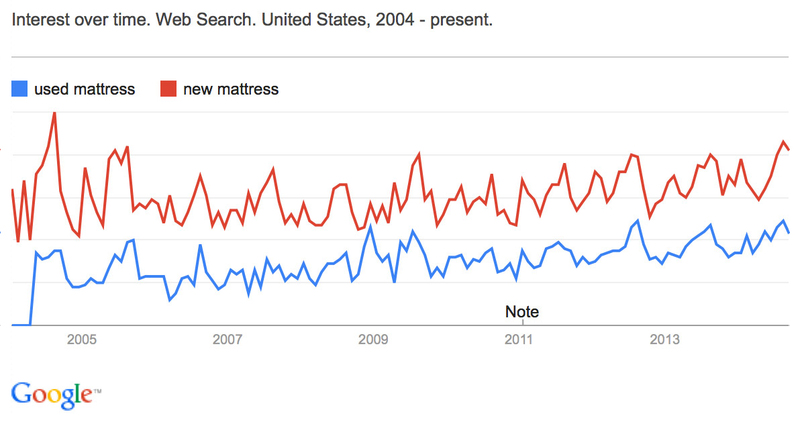 Using Google Trends, we found that new mattresses are listed roughly 2x as often as used mattress on the internet. Again, this is surprising data because we found that only 10% of customers are interested in used mattresses. Most likely, this is because there are more used mattresses available than are being sold. Less likely, but still possible, is the idea that people felt uncomfortable being honest about whether they’d be a used mattress in our poll (let’s hope you’re not staying at their Airbnb!). When is the best time to sell a used mattress? August is the most popular month for both used and new mattresses. The second most popular month is January. This lines up with industry experts’ suggestion of buying furniture in August and January due to new furniture entering stores. New furniture releases mean sales and clearance pricing. What does this mean for how you sell your used mattress? Many people attempt to sell their used mattress, but not as many people are interested in buying used mattresses. This means that there should be a ton of supply for used mattresses, which should drive prices down. If you’re trying to sell a used mattress… you’re not going to get much for the mattress, due to the simple fact that it’s used. To help increase your possible payout, try to increase the perception of it being as new as possible. If any of the following is true, add it to your listing to increase your odds of selling! Try to sell your mattress in late fall or late spring. You’ll want to avoid the competition from furniture stores that comes in August and January. If you’re one of the 10% of people who don’t mind buying a used mattress… you’re in a buyer’s market! Be tough when negotiating with sellers, and don’t be afraid to shoot for a low price. Odds are, they aren’t getting many offers from anyone else. Alternatively, you can agree to the price, but ask that they take care of delivery (and make sure to let them know that Dolly is a great, inexpensive way to bring their used mattress to its new home!). Buy in August or January to take advantage of the high-volume market. Many people will be looking to take advantage of the pricing deals, therefore getting rid of their old mattress. Take advantage of this! It’s hard to pinpoint an exact value without knowing the details about the mattress. You can run the different attributes through Blue Book for Furniture to get an estimate of its value, but the real market value is probably even lower. The most typical mattress price in the secondhand market is $250. Once the mattress has been taken out of its protective seal, it’s going to lose value similar to how a brand new car loses value after driving off the lot. We’d suggest a healthy dose of low expectations when forecasting the future value of your mattress, otherwise you may be sorely disappointed. No matter what your mattress is worth, it might need hauling, whether that’s to your new apartment or the dump. Book a Dolly to find Helpers who’ll bring your mattress to its destination, whether it be into the home of an excited new owner, or to its final destination at the dump.